Summary: The goal of this project is to reprint and distribute the very successful sea turtle life-history posters depicting the five species of sea turtles found in Florida waters (illustrations attached), and to design, produce, and distribute a Spanish version of each poster. Each of the original five posters featured accurate biological illustrations of an individual species showing its life cycle, migrations, ecological relationships, threats, and conservation needs. Dawn Witherington completed the original poster illustrations and design, and she has agreed to do any redesigning required for the Spanish translation.The existing text will be translated into Spanish for each current poster design. Printed posters will be 24” x 36”, full (4) color, and on heavyweight FSC-Certified paper. Full poster sets will be distributed to recipients in Florida, especially teachers. With the goal of maximizing exposure, STC will also work with distribution locations established during the original grant in 2009. 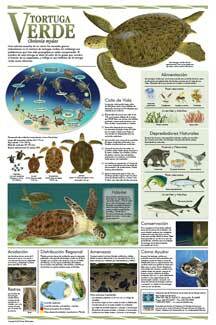 Results: Each of the sea turtle life history posters was reviewed for any changes that needed to be made before reprinting. Slight modifications to the range maps were made by the artist, Dawn Witherington, and all five posters have been re-printed. Nearly all of the poster sets have been distributed directly to teachers, provided to permit holders and distributed at events. The Spanish translation was completed after a delay as the original group STC was working with to do the translation had a staff change before the translation was complete. Another translator was contracted at the start of 2015, and they provided STC will Spanish translations for all five posters. The Spanish text was provided to Dawn to place the text into the posters. Dawn and the translator worked together to ensure that the text fit each of the posters. One thousand of each of the Spanish species posters was printed and they continue to be distributed.